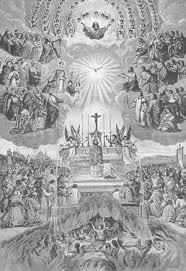 A blessed solemnity of All Saints’ to all our readers, a feast that goes back to the earliest days of the Church, as a commemoration of all the countless martyrs who could not have their own particular day. Eventually, this was extended to include all those who had lived holy lives, unknown to the broader history, yet enjoying eternal beatitude with God. The Jehovah’s witnesses get this wrong, thinking there will only be ‘144,000’ in heaven, from Revelation 7:4. Yet a few verses later, the author, Saint John the Apostle, is then given a vision of ‘a great multitude which no man could number’, who had come through the tribulations of this life faithful to God. There can be people who have totally destroyed their desire for truth and readiness to love, people for whom everything has become a lie, people who have lived for hatred and have suppressed all love within themselves. This is a terrifying thought, but alarming profiles of this type can be seen in certain figures of our own history. In such people all would be beyond remedy and the destruction of good would be irrevocable: this is what we mean by the word Hell. On the other hand there can be people who are utterly pure, completely permeated by God, and thus fully open to their neighbours—people for whom communion with God even now gives direction to their entire being and whose journey towards God only brings to fulfilment what they already are. For the great majority of people—we may suppose—there remains in the depths of their being an ultimate interior openness to truth, to love, to God. In the concrete choices of life, however, it is covered over by ever new compromises with evil —much filth covers purity, but the thirst for purity remains and it still constantly re-emerges from all that is base and remains present in the soul. God’s mercy is infinite, and His love and desire for the salvation of souls relentless; the ‘hound of heaven’ does not give up. From what the last Apostle saw, we may indeed hope that many ‘myriads’ will in the end open themselves to the grace of God, and, whether by the purification of Purgatory (which we commemorate tomorrow on All Souls’ Day), or at the instant of death, will be with that same God forever, perfectly fulfilled, seeing God ‘as He is’, and therefore becoming ‘like Him’. We cannot imagine such an eternity, for any image fails us, always mired in the passing and temporal joys of this life, taken to the extreme in Islam with its sensual paradise and the 72 hapless virgins. On the contrary: Beatitude is a fulfilment of the soul and mind which joy, as Thomas says, redounds upon our resurrected and spiritual body in ways that far, far transcend any earthly pleasures, be they of the nuptial bed or the dining table. To imagine ourselves outside the temporality that imprisons us and in some way to sense that eternity is not an unending succession of days in the calendar, but something more like the supreme moment of satisfaction, in which totality embraces us and we embrace totality—this we can only attempt. It would be like plunging into the ocean of infinite love, a moment in which time—the before and after—no longer exists. We can only attempt to grasp the idea that such a moment is life in the full sense, a plunging ever anew into the vastness of being, in which we are simply overwhelmed with joy. This is how Jesus expresses it in Saint John’s Gospel: “I will see you again and your hearts will rejoice, and no one will take your joy from you” (16:22). There are glimpses of this joy in this life, transitory and fleeting, a prelude of the infinite joy and peace that no one will take it from us, if we but trust in God, His Christ, His Church, and persevere to the end. All holy men and women, orate pro nobis.